(Washington, DC) – As the temperature begins to cool here in the United States, a bitter and brutal cold has crept into the air surrounding the Tyson beef plant in Brooks, Alberta, Canada. More than 2,300 workers, many of them workers who are refugees from the Sudan, have been forced onto the streets and onto picket lines in a battle to preserve a decent standard of living. Tyson is leaving workers and their families out in the cold, again. Workers at the Brooks plant stood up for a voice with the United Food and Commercial Workers (UFCW) Local 401 in August, 2004, eager for basic workplace protections such as an end to harassment, improved safety training, and better handling of biological hazards. More than 600 Sudanese immigrant workers were lured to Alberta with the promise of a good job and bright future. Tyson’s disregard for the basic safety needs of its workforce, immigrant and native, is reprehensible. Picket lines went up on October 12, 2005 after Tyson Foods threw out a proposal by a mediator appointed by the Alberta government to facilitate a first-contract agreement. Provincial law enforcement officers stood by yesterday as replacement workers and management verbally and physically assaulted Sudanese workers with racially-motivated jeers and anti-immigrant insults. Several strikers were reportedly beaten with metal pipes, left injured in a ditch before being transported to the hospital. “Tyson recruits workers from all over the world to bring them to work in their North American operations in a race to the bottom. Exploitation of a vulnerable immigrant workforce is part of their business plan. Now, it is particularly galling to see that the Tyson is allowing racially-motivated violence to take place on the picket line,” continued Hansen. Tyson’s behavior in Alberta follows a pattern it sets in the United States – doing everything in its power to lower wages, cut benefits and reduce workplace standards for employees, particularly immigrant workers. In 2003, Tyson forced long-time meat processing workers in Jefferson, Wisconsin onto picket lines for nearly one year in order to lower wage and benefit levels for unionized workers in the United States. In this instance, Tyson’s message to the black immigrant workforce is clear: we brought you to this continent so that we can pay you less than native workers. Tyson Foods is the Wal-Mart of the meat industry – dominating 27 percent of all beef, pork and chicken sales in the U.S. But size doesn’t give it the excuse to drag workers’ wages, health care benefits, and workplace standards to the even lower levels. The company carries very little debt and share prices have increased by 25% in the last year. Tyson has no financial need to demand sub-standard wage and benefit levels for workers in the U.S. or Canada. The Brooks facility handles 40% of all beef slaughter in Canada. It operates under the name “Lakeside Packers.” Tyson has owned the plant for ten years. UFCW members in the U.S. will be marching and leafletting in support of the strikers at the Millions More Movement on the National Mall in Washington, DC tomorrow. WakeUpWalMart.com issued the following response to Wal-Mart’s CEO Lee Scott’s announcement today that Wal-Mart would work to tighten standards at its overseas suppliers. “”Unfortunately, Wal-Mart’s exploitation of workers is not limited to its use of sweatshop labor overseas. Our campaign is building a sea of public pressure to force Wal-Mart to end its race-to-the-bottom business model. For too long, the American people have paid the price as Wal-Mart has relied on sweatshop labor to produce its cheap products. We will continue to work hard to get Wal-Mart to change its outrageous practices of exploiting sweatshop labor and failing to meet international labor standards. But, sweatshop labor is only the beginning of the long list of problems that Wal-Mart must address. We welcome the opportunity to have a dialogue with Wal-Mart about how it can improve working conditions both here and abroad, but we know that actions speak louder than word. We hope Wal-Mart will accept our ‘Six Demands for Change’ and work with us to form a partnership for change. UFCW Canada Press Release — The national director of the union on strike at a Tyson Food’s plant (Lakeside Packers) in Brooks, Alberta, Canada has stepped up his call for Prime Minister Paul Martin to facilitate a resolution “”before someone gets killed””, in the wake of three picketers and the union’s local president all being hospitalized after being attacked by Tyson company personnel. Click here to watch live video taken at the scene of the car accident. It is the second time this week Fraser has called on the Prime Minister to get involved. Fraser made his latest comments while enroute to Alberta where yesterday Doug O’Halloran, the president of UFCW Local 401, was chased and forced off the road by cars driven by Lakeside Packers management personnel. O’Halloran is now listed in guarded condition. Arkansas-based Tyson Foods, the owners of Lakeside Packers, forced the strike after rejecting a settlement drafted by a mediator appointed by the Alberta government to facilitate a first-contract agreement. One year ago today, the United Food and Commercial Workers International Union unveiled a massive display on in the heart of Washington DC to mark the sacrifices by the sons and daughters of working America serving at the call of their government in Iraq. On that day, 7,480 U.S. soldiers had been wounded and 1,076 killed. Today, the number of those wounded stands at 14,641 while the number of those killed is 2,161. The UFCW will never forget the sacrifice of our service men and women, their courage and commitment, and the grief of their families. We will continue to update the display at the corner of our building on K St. NW and 18th St. NW in Washington DC as a reminder to the corporate lobbyists and foreign policy think tanks that dominate the canyons of K St. NW, as well as the leaders around the corner at the White House and up the hill in Congress, that the policies they advocate and the decisions they make have a flesh and blood impact on our sons and daughters. Oct. 13, 2005 – Washington, D.C. – WakeUpWalMart.com, the group leading the national fight to change Wal-Mart, announced today it had achieved a record milestone of public support. In the last six months, over 103,052 Americans have joined the WakeUpWalMart.com movement. The WakeUpWalMart.com campaign enjoys growing grassroots support in all 50 states, and is one of America’s fastest growing social and political movements. Today, WakeUpWalMart.com also announced an exciting new partnership with two of the largest grassroots organizations in the country – Jobs with Justice and ACORN. The alliance between Jobs with Justice, ACORN, and WakeUpWalMart.com builds an unparalleled force for change with thousands of activists, on-the-ground organizers and community groups ready to help change Wal-Mart in every town and city in America. Jobs with Justice and ACORN will be instrumental in helping WakeUpWalMart.com raise public awareness of why Wal-Mart needs to change beginning with Wal-Mart Week in November and extending through the entire holiday season. “”This is a new day in the fight to change Wal-Mart. We have created an unprecedented, bottom-up force for change which will demonstrate why Wal-Mart needs to change now,”” added Maude Hurd, ACORN’s national president. “”We are building the largest grassroots movement in history to change Wal-Mart. Our movement is led by community coalitions who believe America’s largest corporation should reflect the best in American values,”” said Fred Azcarate, executive director of Jobs with Justice. ACORN, the Association of Community Organizations for Reform Now, is the nation’s largest community organization of low- and moderate-income families, working together for social justice and stronger communities. Since 1970, ACORN has grown to more than 175,000 member families, organized in 850 neighborhood chapters in 75 cities across the U.S. and in cities in Canada, the Dominican Republic and Peru. Jobs with Justice (JwJ) is a national network of local coalitions that connect labor, faith-based, community, and student organizations to work together on workplace and community social justice campaigns. JwJ coalitions now exist in over 40 cities in 29 states in all regions of the country. Washington – The United Food and Commercial Workers International Union (UFCW) members, constituency groups and local unions have opened their hearts over the past few weeks and generously contributed to the wellbeing of Hurricane Katrina victims. The UFCW Katrina Relief Fund has topped a half-million dollars, and representatives from UFCW regions 3 and 5 have been using the funds to help more than 1,000 UFCW members affected by the storm. The UFCW has also been assisting members returning to their homes in New Orleans and other devastated areas in getting transition housing and jobs, as well as in cleaning up and rebuilding damaged homes. Additionally, several UFCW local unions have distributed food and have adopted members, and their families, who have been left homeless by Katrina. UFCW Regions 3 and 5 continue their outreach efforts aiming at accounting for every UFCW member affected by the storm. Katrina-affected members can call 866-820-6141. While short-term efforts continue, UFCW members affected by the hurricane will be rebuilding their lives for some time, and the UFCW will continue sustaining members through this difficult time. For further Katrina-related information, please refer to www.ufcw.org. In an interview with Business Week, posted on their website today, Wal-Mart’s CEO did not answer a very important question. Wal-Mart has a great opportunity to work with us to help improve the lives of so many Americans who face an economic and health care crisis everyday, everywhere in America. The American people want to know, will Wal-Mart do what is right for America or will Wal-Mart lead a race to the bottom. Cong. Brown’s “”Wal-Mart Hearing”” represents a dramatic next step in the growing movement to change Wal-Mart and build a better America. This hearing will help educate consumers about why Wal-Mart needs to change and build greater public awareness and political support to change Wal-Mart into a more responsible corporate actor. As America will no doubt learn from this hearing, Wal-Mart needlessly chooses to “”do the wrong thing”” even though they have the means and wherewithal to “”do what is right.”” The question Wal-Mart must now answer is, when will they stand up and finally address the negative effects their business practices have on their employees, their families, the community, and the nation? We hope Wal-Mart will finally listen to the growing chorus of community voices and work with us to make Wal-Mart into a company that reflects the best of America’s values everyday. Washington – The United Food and Commercial Workers International Union (UFCW) Katrina Relief Fund continues to grow with generous contributions from workers and organizations, and now approaches $350,000, thanks to a $50,000 contribution made in the past few days by UFCW Canada. UFCW Canada has also pledged to raise another $200,000 for the relief fund. Moreover, United Latinos of UFCW has also contributed $50,000. Meanwhile, the UFCW began finding and helping more Katrina survivors in Alabama while continuing to help and to find affected members in Mississippi and Louisiana. Until now, most requests for assistance were coming from UFCW workers employed in Louisiana who were affected by the hurricane, but UFCW leaders and workers have been canvassing Mississippi and Alabama looking for members in need. The call volume at UFCW’s Katrina assistance hot line has been increasing steadily as members talk to each other, and as UFCW continues placing announcements in shelters. 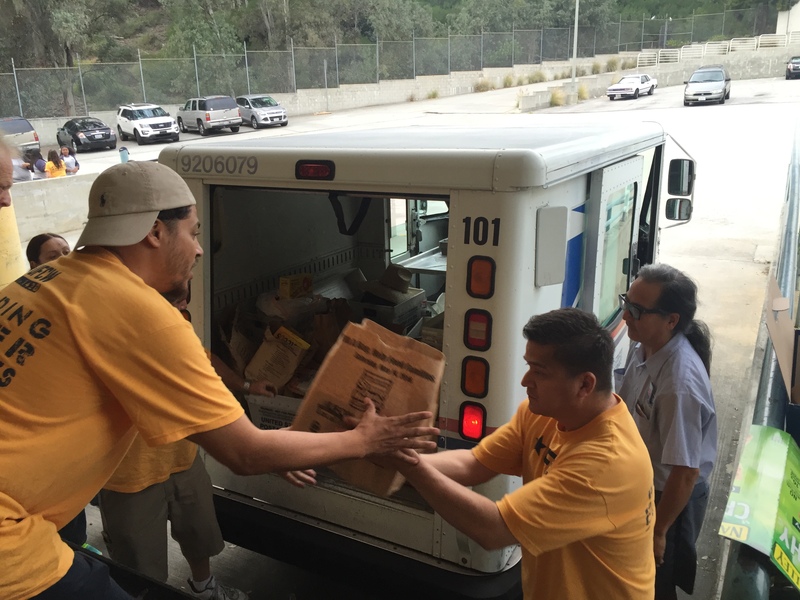 In addition to providing groceries, UFCW, union leaders and members have been helping connect workers with their families. They have been helping workers find government, non-profit and community assistance. They are helping workers and their families find shelter – partly through UFCW’s Adopt-a-Family program – and sometimes helping them relocate and find new jobs. UFCW has placed special effort in finding members sheltered at the Houston Astrodome. UFCW International President Joe Hansen and Canada’s National Director Michael J. Fraser encouraged local unions to adopt UFCW families displaced by the storm. UFCW has thousands of members in southern states that have been affected by the storm. UFCW recently identified and began assisting nursing home workers in Alabama. UFCW members experiencing the worse impact from the storm include those employed by Domino Sugar Co. in Chalmette, LA. Other affected UFCW members include those working at poultry processor Sanderson Farms, at an oil refinery, at barber shops, and at a Sara Lee plant in Mississippi. For additional Katrina-related information, please refer to UFCW’s website at www.ufcw.org. UFCW Region 5 employee Arlene Carrow Crocker has been taking most of the hot line calls. She has never experienced anything more emotional or heartbreaking. “”For some of our Domino Sugar members, I believe that the realization of any major loss is just now setting in,” she said. “With an open heart, I try to find the right words, but I realize that only time will heal their wounds.”” In addition to the UFCW, other unions of the recently formed Change to Win Coalition have implemented Katrina-victim relief programs of their own and in collaboration with other unions. Please feel free to publicize the UFCW Katrina Relief Fund hot line – (866) 820-6141. For any photographs illustrating UFCW efforts in the field, you may contact Federico Cura. Morristown, Tenn. – The 700 workers at the Koch Foods poultry processing plant now have a voice on the job with the United Food and Commercial Workers (UFCW) Local 1995. Workers voted overwhelmingly in favor of union representation during the vote on Friday, September 9, 2005 with 465 yes votes, 18 no, 12 voided ballots and 10 challenged by the Labor Board. This is victory for the Koch Foods workers, but also the entire Morristown community. Workers reached out and gathered support from area churches, congregations and other community groups. The company agreed to remain neutral throughout the union campaign – which allowed for workers to vote in an environment free from intimidation or harassment. “Workers, the community and the company are now working together to make a better workplace and a better life for the 700 families at Koch Foods. When workers came together to demand better wages and working conditions, management responded positively. This process has been a positive situation for everyone,” said Bill McDonough, UFCW Executive Vice President and Director of Organizing. The union drive at Koch Foods was the subject of a New York Times article on September 6, 2005 highlighting a resurgence of union activity among poultry plants in the South. Poultry workers at the Gold Kist plant in Russellville, Alabama continue to organize. UFCW is the nation’s leading poultry worker organization with more than 60,000 of its 1.4 million members working in the poultry industry.